I am really rather fond of Thanksgiving. Like a lot. A lot. A lot. Thanksgiving is my very favorite holiday to host. Since I love Thanksgiving so much, this week on the blog I am dedicating the whole week to Thanksgiving Food. I am am declaring it Thanksgiving: Let's Eat Week. All week long, I am sharing some of our favorite Thanksgiving recipes. 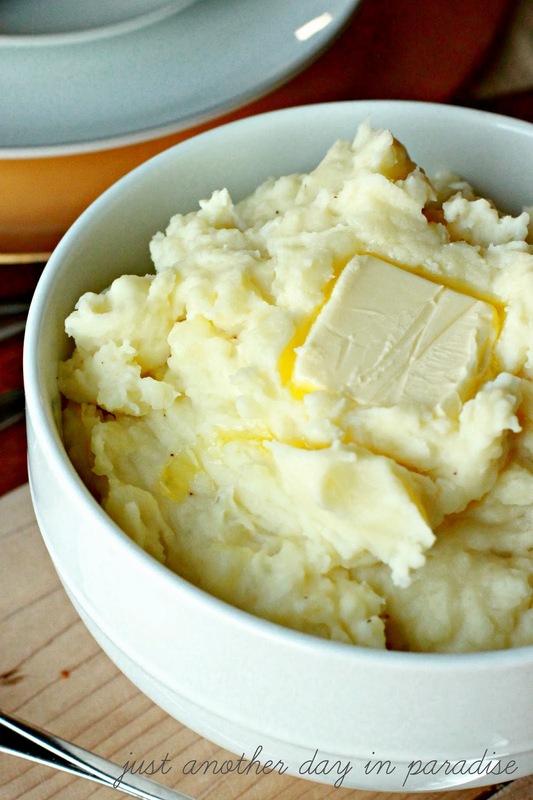 What better Thanksgiving recipe to kick of the week, than the tried and true staple side, Mashed Potatoes. "Ma, these potatoes are so creamy." (Name the movie...we haven't played this game in awhile. By the way this is one of my favorite movies of all time). Let me clarify though, these are not your average potatoes. There is a little something extra in there...and it is not just the love. The little something extra is both garlic AND cream cheese. I tell you what, this will change your potato-eating world. 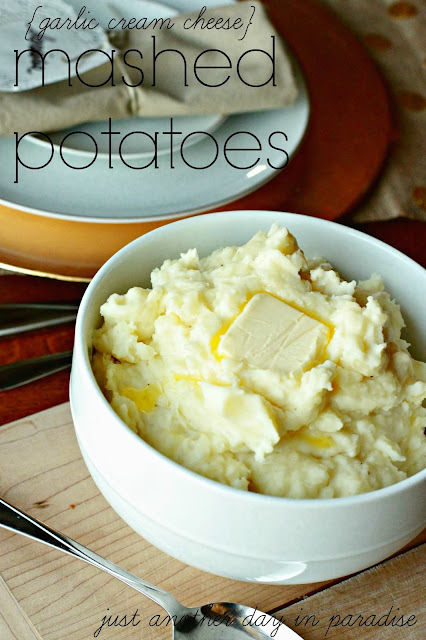 I also have a couple of tried and true tricks to make your mashed potatoes packed with flavor. Since we are running out of time until Thanksgiving, I will dispense with my normal witty banter and endlessly flowing chatter, and we will get right to how to make these to.die.for. potatoes. First, let's share my secret weapon for making flavorful potatoes. My secret weapon...chicken stock. Instead of boiling my potatoes in strictly water, I boil them in mostly chicken stock with only a bit of water added in. This totally locks in some great flavor. Another flavor secret weapon is that I add the minced garlic to the chicken stock as the potatoes are cooking. All that mingling in one big pot makes for one awesomely flavorful batch of mashed potatoes. I never make mashed potatoes any other way. Ever. Now that I have shared my secret flavor weapon, let us get to this recipe for Garlic Cream Cheese Mashed Potatoes. I know they will make many a Thanksgiving Feast partakers happy. Place the potatoes in a large stock pot. Add the chicken stock. Add enough water to cover the potatoes ( for me this is usually about 1 cup). Add in the garlic and salt. Bring to a boil. Keep the potatoes at a boil until they are easily pierced by a fork. Depending on the size of the potato cubes, this could be anywhere from 20-30 minutes. Check frequently. Once the potatoes are cooked. Drain the water from the stock pot. Some of the garlic will drain with the water, that is okay. To the hot potatoes, add the butter and the cream cheese. Mash. I prefer to use a hand masher because I like lumps in my potatoes. If you like your potatoes as smooth as silk, use an electric hand mixer. Serve warm with additional butter, because you can't have too much of that. Come back tomorrow for more Thanksgiving: Let's Eat Week. I will be sharing a recipe for Brussel Sprouts. Don't be hating on the Brussel Sprouts. I dressed 'em up with some bacon. Bacon makes everything magical, even Brussel Sprouts. I absolutely love mashed potatoes! I have pinned your recipe and plan on making it for Thanksgiving, thanks! 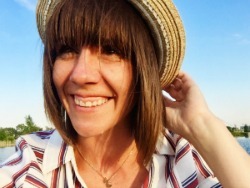 Melissa, you will love them! I just know it. Thanks for pinning!